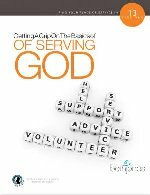 Description: This workbook, will help pastors, church leaders and believers discover their God-given destiny and His plan for service and leadership in the local church. Building a Firm Foundation for the Victorious Christian Life. God has a destiny for your life! Where do you fit in God's plan? How do you find your place of service in God's kingdom? What gifts or talents has God given you for serving him? Is there a place for you in the local church? Getting a Grip on the Basics of Serving God is a powerful study guide designed for either individual or group use to help new and mature Christians understand foundational principles of serving God. Through studying the Scriptures and completing this workbook, Christians will discover the thrill and adventure God has prepared for them as they serve God, serve His people and service through their church.